There had been news floating around that the next conflict to get the ‘Commands & Colors’ treatment would be the American Revolution (or the American War of Independence, as we Brits know it) – there had even been rumours that it would contain miniatures from The Plastic Soldier Company – no doubt fuelled by PSC Games involvement in Hold The Line. 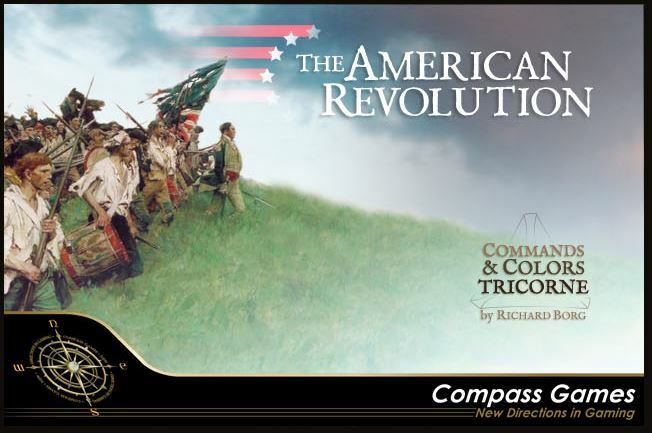 A Kickstarter project has been launched to fund Commands & Colors: Tricorne by Compass Games. First off, Command Cards and dice look to be the same, though it may look like the dice replaces one of its usual ‘Infantry’ sides with a flag, meaning that units are perhaps more likely to break when under fire. The board is bigger than usual. A ‘standard’ C&C board is 13 x 9 hexes, whilst this is 13 x 11 – in other words, the same size as the board in ‘The Great War’. A Combat Cards deck is again being used, in the same way as The Great War, Samurai Battles and Commands & Colors: Napoleonics (Expansion 5). However, in a new twist, the British and Continental armies get their own decks of 24 Combat Cards each, which are different in order to better reflect the different tactical doctrine of each army – that’s a really nice twist. The game will include wooden blocks to represent troops rather than miniatures, in the same way as C&C: Ancients and C&C: Napoleonics. The pledge level for a single copy of the game is $80, with US shipping estimated at $15, with Canada priced at $27, but the Rest of the World is a whopping $47. This is Compass Games first Kickstarter project, and looking through the details of the project, they do not appear to be offering any stretch goals, or bonus material for backing the project. One would imagine (or at least hope) that the pledge cost will be less that MRRP, but this isn’t clear. The project is looking for a funding target of $7,500 – at time of writing it approx. 90% funded. However, the project is also running for a couple of months – the end date is the 26th May 2017, with delivery due in July 2017. If this is the case, then production of this game must be quite far along, and this project would almost seem like something of a pre-order system. I’m a huge fan of Commands & Colors games, and the changes made for this edition look really interesting. However, unless they can find a more Europe-friendly delivery service, I will probably give this a miss. Given the current exchange rate, this game would work out at over £100 including delivery (and that’s before we add VAT and import duty). That price point is simply too high, so I will wait until the game is published and hopefully pick it up from one of the major UK boardgame suppliers. It’s cheaper to pre-order directly from their website. However the postage cost to Australia is horrible. But you can no longer pre-order from the website. They are honoring the past pre-orders but any new ones have to go through KS. It’s interesting that in their comments they basically say “we messed up the Kickstarter portion of this”. But the game itself looks great! Agreed, the game itself looks very good indeed – but that isn’t the problem with the project. Unless they can find more friendly shipping rates to the ROW, or European distribution, then I am afraid that I won’t be backing it. Lucky I pre-ordered a copy when Neil first spoke about this a few months ago. I honestly cannot wait for this to get put into my block head collection. I want to play this sooooo bad.